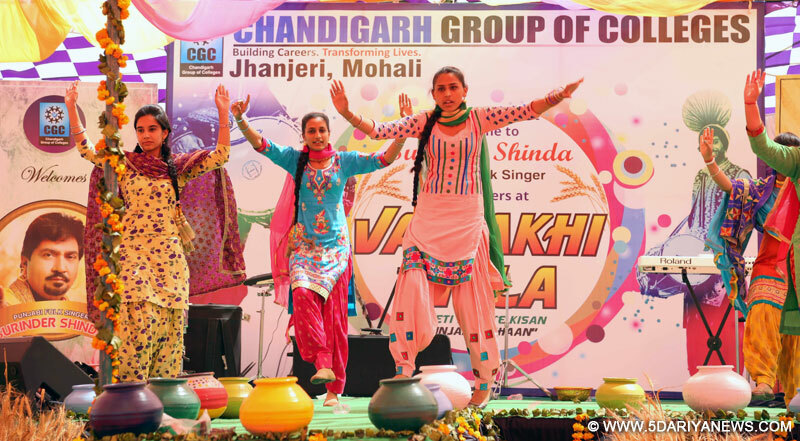 CGC Jhanjeri celebrated Baisakhi with enthusiasm. The campus was a buzzed with decorations depicting the harvest season. Students were explained about the importance of the festival by showcasing the Punjabi culture. Surinder Shinda famous and renowned Punjabi singer enthralled the show with his songs. Dhol beats and Punjabi folk music added excitement. Students also came dressed in traditional Punjabi colourful outfits with ornaments and accessories. The program began with presentations by students in form of group songs, speeches and dances. The whole school came alive with a brilliant bhangra performance, which was the highlight of the program. Stalls of famous punjabi cuisine were also arranged by the students which gave a real scene of punjabi culture & tradition under on one roof.While speaking at the moment Raspal Singh Dhaliwal, President CGC said that the motive behind the celebrations was to apprise the children of their rich culture and heritage. According to him Baisakhi was not only a harvest festival but also an auspicious day as on this day Guru Gobind Singh had established the Khalsa Panth. He further added that Baisakhi is a festival of positive approach to life even during odd times. According to him educational institutions has great role and responsibility of making students aware of their culture and tradition.